Yup, it’s pretty darned big. Something like 7 inches of ease, I think? But you know, I almost don’t even care what it looks like. I used up some of the guiltiest part of my stash. I used this pattern to help me with some of the Patons Divine stash (3 colours and about 8 balls each) that’s been marinating for over 2 years. 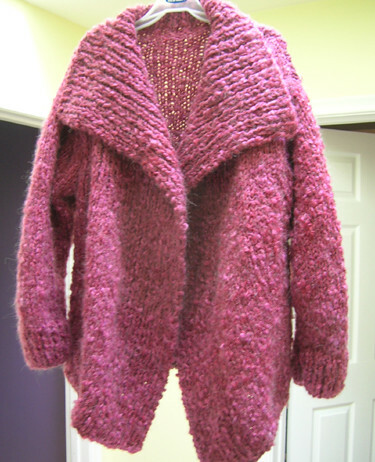 This pink stuff was used in two previous knitting attempts and sat for months unused – finally, it has a home, matched up with the Patons Merino to become the warmest, coziest, floppiest, biggest house sweater I’ve ever owned. I can’t say I’m rushing to model it now, seeing as spring has shown up, but I’m quite sure I’ll be glad for it come next winter when sub-zero temperatures hit and I want something to cozy up in around the house. That looks like it will be a good cuddle up on the couch and watch tv jacket. I think it looks wonderful – and it really is a lovely colour! But 24 balls of Divine, just a PART of your stash! Hope you’re wearing your hair-shirt…. it may have a lot of ease, but it looks snuggly and comfy! Very nice, looks so comfy. Wow, that came together quickly! I’ll bet it’s nice and soft and cuddly. Nice job. Congratulations! That is quite the stash buster — 1800 yards! Fast, stash busting, warm and pink – what more could you want? !